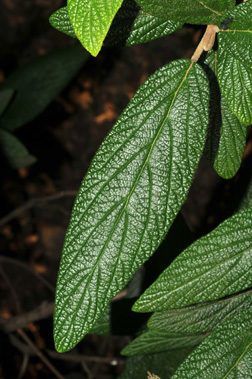 Leaf:Opposite, simple, evergreen, narrowly oblong, 4 to 7 inches long, entire margin, conspicuously wrinkled, scruffy and thick, dark green above, much paler and tomentose below. 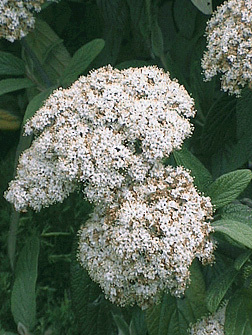 Flower:Showy 3 to 7 inch clusters of small white flowers, appearing in mid-spring. 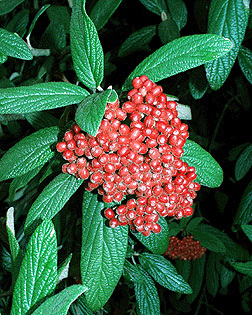 Fruit:Clusters of oval drupes (1/3 inch long) that are initially red and scaly, later turning black, ripen in late summer. 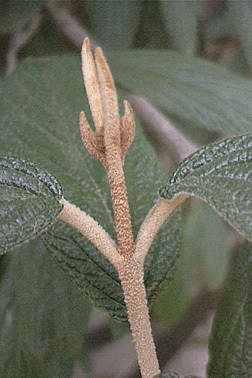 Twig:Moderate, very tomentose, tan to rusty brown; terminal buds large, naked and fuzzy, flower buds in a tight cluster. 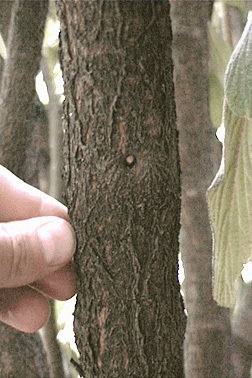 Bark:Dark gray with shallow splits. 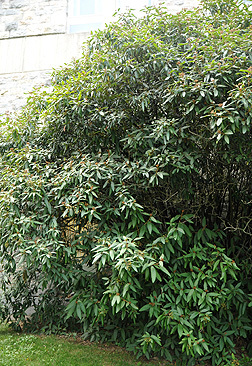 Form:A large, multi-stemmed, dense shrub that reaches heights of 15 feet.